The United States Army Garrison (USAG), Japan, Torii Station is the premier base operations support (BOS) provider to Army units in Asia. Torii Station is located in Yomitan-son, Okinawa Prefecture, Japan. The Army on Okinawa is responsible for the critical function for all US services on Okinawa. The major functions include receiving and distributing cargo, distributing the island's military fuel supply, and port operations. The USAG Japan, Torii Station is the IMCOM's most widely dispersed Garrison, responsible for base operations support of 16 sites, ranging from our headquarters at Camp Zama on the eastern coast of mainland Japan (Honshu), about 25 miles southwest of Tokyo, to Torii Station in Okinawa, the second largest installation, 900 miles south of Camp Zama. The installations operated and maintained by the USAG Japan, Torii Station includes 3,864.58 acres with 10,228,759 square feet of buildings and 944 family housing units. Installations on Honshu include Camp Zama, Sagamihara Family Housing Area (SFHA), Sagami General Depot (SGD), Yokohama North Dock (YND), Akasaka Press Center (Tokyo), and Kure Pier 6/Ondo Family Housing Area; two communications sites: Shariki, added in May 2006, and Haigamine; and three ammunition depots: Kawakami, Akizuki, and Hiro. There are five installations on Okinawa: Torii Station; White Beach; Petroleum, Oils and Lubricants (POL) Facilities; Naha Military Port; and Gesagi Communications Site. Ideally, your sponsor should meet you at the airport. If you arrive through Naha International Airport or Naha Domestic Airport, as soon as you exit the baggage area, clear Customs and Immigrations. If your sponsor is not there, at the International Airport, look back at the double doors near customs. There is a red sign to the left saying "Welcome to Okinawa U.S. Military Phone". Follow its' directions. If you arrived via the domestic airport, ask for assistance at the information desk on the use of the pay phone. From here dial 911-5111 to get a base dial tone; then dial the DSN number you wish to dial. You may also be able to get a ride with the Marine Corps or Air Force who pick up personnel from both airports daily. They can at least get you onto one of the military installations where you can call your unit's staff duty office for more assistance DSN: 315-644-4708 or commercial: 011-81-611-744-4708. If you arrive through Kadena Air Base on an AMC flight, you hopefully will be linked to your sponsor upon exiting the customs area. If your sponsor isn't there, one of the AMC greeters can assist you in making contact with your unit or sponsor. The United States Army Garrison (USAG), Japan, Torii Station is home to 1/1 SFG, 10th Area Support Group (As the host Army installation activity, the 10th ASG provides Army activities and units on Okinawa a full range of base operations support. Responsible for coordinating with the sister services and the Government of Japan, it also maintains liaison to further mutual cooperation and understanding between the U. S. Army and the Japanese Ground Self-Defense Force), 505th Quartermaster Battalion, 58th Signal Battalion, 835th Transportation Battalion, 83d Ordinance Battalion and U. S. Army Engineering Detachment. The main lodging office is located at the Shogun Inn, Bldg. 332. To make reservations, call DSN: 315-632-1100/1101. Cost for on-base quarters is based on where you are assigned and not what your rank is. If on-base quarters are not available, then contract quarters for TDY guests will be utilized. Non-availability statements/numbers are issued when on-base quarters and contract quarters are not available. Distinguished Visitor Suites are available for O-6's and above (civilian equivalent). Individuals requesting DV suites should contact Wing Protocol at DSN: 315-634-0106/1808. There are 122 family units on Kadena AB. Due to the high volume of guests, families PCSing in are authorized 30 days in TLFs. Extensions will only be granted on a space-available basis. TLFs are normally available; however, during the peak PCS season (May-Sept) families may have to secure lodging at off-base hotels. A list of off-base hotels is available to you or your sponsor at the Shogun Inn front desk. It is important that you or your sponsor make reservations for TLF as soon as you receive your port call. Pets are not allowed in any on-base lodging facilities. Contact your sponsor for assistance if traveling with pets. 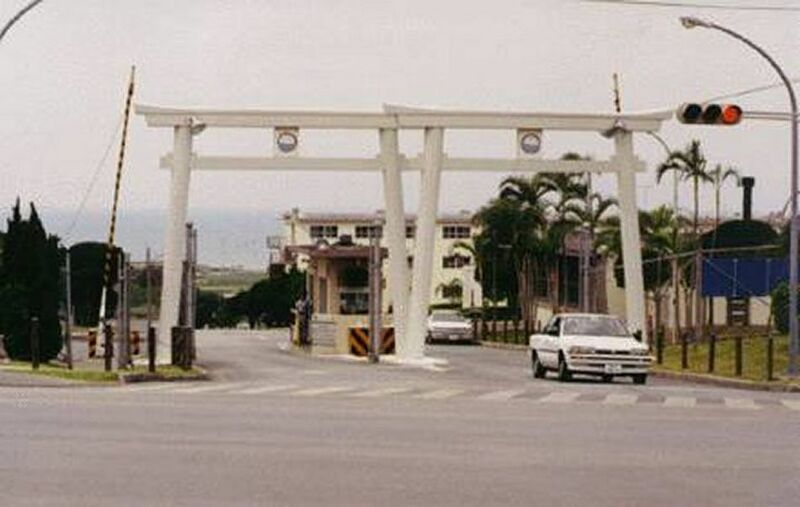 All housing on the Okinawa is managed by the Housing Office on Kadena Air Base. Satellite offices are located at Camp Courtney and Camp Kinser. Personnel assigned to Camps Hansen, Schwab, Courtney, or McTureous, White Beach should make appointments for on-base housing at Camp Courtney. Personnel assigned to MCAS Futenma, Camp Kinser, and Naha Port should report to Camp Kinser. Personnel assigned to all other areas on Okinawa should make appointments for on-base housing at the Kadena Housing Office. Eligible personnel must submit an advance application (DD Fm 1746, Application for Assignment to Housing) to the gaining installation for family housing at any time after they have received PCS or active duty orders. Applicants should provide any information regarding an impending promotion, an expected increase in the number of dependents, or a family member's maturation which would qualify an eligible applicant for more bedrooms within the next 12 months. If advance application is not received, members will receive the date of walk-in as the application/eligibility date on the waitlist. This form should be mailed along with a copy of orders to the following address: 718 CES/CEH, Unit 5261, APO AP 96368-5261. The DoD standard for commute time between home and work is 60 minutes or less. Units will be offered on the principle that individuals will be housed in an area within reasonable geographic proximity to their workstation. The Central, Northern and Southern Boundaries will be eliminated and instead, customers will be offered available units within the DoD standard of 60-minute commute area. Customers will generally be offered units closest to their duty location but will no longer have the option to wait for a unit at a specific location. Additionally, customers will no longer have the option to wait for a specific unit type (single, multiplex, duplex, or tower). The first available unit for grade and bedroom requirement will be offered based on the location priority. This policy will ensure, overall, that residents will be located as close as possible to their duty location and allow the DoD Family Housing Office to meet the required occupancy rate. Within the first three days after arriving on station, all personnel should report to the Housing Office. The first appointment is a mass inprocessing briefing. This briefing acquaints the member with the housing policies and procedures. Newcomers should have their sponsor make the appointment for them ahead of their arrival. All off-base housing must be approved by the Housing Office before a lease is signed. Pets are not authorized in any of the on-base high-rise or mid-rise apartments. There are no Child Development Centers located on Torii Station. Child Care services are provided by the Air Force and the Marine Corps. Licensed Family Day Care is available on all bases. There are no services for before or after school care on Torii Station. Both the Air Force and Marine Corps offer programs for Before and After School Program (BASP) through their Youth Services. These programs help meet the needs of both single and working parents. The program provides activities for children Kindergarten through 12 years of age while parents are at work during the before and after school hours. Conducted in classroom group settings, the BASP offers programs such as arts and crafts, outdoor activities and short field trips which are planned to stimulate and enhance the well-being of each individual youth. Registration and fees for the BASP are collected in the registration office. Holiday Camp and Summer Camp are similar to the BASP but are conducted only during holidays and summer vacations. The programs provide a variety of day-long activities such as swimming, bowling, arts and crafts, field trips and much more. The programs begin the first day of the school break and continue through the last day of the vacation. Education packets for DoD schools are available upon request through the schools and may be obtained before your arrival. Your child will temporarily attend the school that is zoned for your Temporary billeting/quarters. Zoning information is available at the School Liaisons Office. When you know where you'll be living (on, or off-base), there's a possibility that your child could be moved to another school, unless you live in the same zoned area. All 12 DoD Dependent Schools (DoDDS) on Okinawa are accredited by the North Central Association of Colleges and Schools. Together they provide an education for about 10,000 students. It is mandatory that all returning students register for each school year. Information updates are required to ensure sufficient staff is available to support student population. The school assignment depends upon the student's grade level and the school zone in which the family resides. School zones change and may be expected to continue to change as the number of accompanied tours increases and new housing is built to accommodate the families. For current information, please call the Bus Registration Office located on Camp Foster upon arrival on Okinawa. All children with disabilities from ages 3 to 21 (unless graduated from high school), who are space required are eligible for an appropriate education on the DoD schools. If you have such dependents in your family, you are required to enroll in the Exceptional Family Member (EFMP) at your current command. EFMP screenings are required prior to a PCS move overseas. American high schools on Okinawa provide strong varsity football, basketball, Track, Tennis, Volleyball, Wrestling, Soccer and other sports programs. In addition to the core subjects, art, music, and physical education programs are conducted by teachers fully qualified in these fields. One of the most unique programs in DoDDS is the host nation culture program. The culture teachers provide Japanese culture and language activities which help students enjoy and appreciate living overseas. Japanese at the secondary level is in the foreign language department along with Spanish, German and French. Numerous post-secondary school courses are available through such field offices as Central Texas College and the University of Maryland. The curriculum you'll study for these classes is imported straight from your school of choice, so there's no loss of quality. Children of military families have the opportunity to receive a quality education that rivals school systems in the U.S.
A medical clinic is located on Torii Station to supply the needs of the active duty personnel assigned to Torii. Army personnel stationed at Fort Buckner will report to Evans Clinic, located on Camp Foster (USMC). Army personnel stationed with 505th Quartermaster Bn will go to the 18th Medical Group on Kadena AB. Army personnel of the 835th Transportation Bn will go to Camp Kinser. Army family members may choose which medical facility to utilize and store their medical records during their stay on Okinawa. They may choose the 18th Medical Group on Kadena AB, USNH Camp Lester or various Navy clinics serving different locations. Facilities require phone-in refills, however, USNH Camp Lester is open for pickups 24 hours. The facilities offer Family Practice. The Naval Hospital, at Camp Lester, is a full-service hospital providing outstanding medical support comparable to most stateside medical facilities. It also runs a Joint Blood Program. While the main facility at Camp Lester provides the primary care, family care is also located at the Bush Clinic at Camp Courtney, Kinser Family Practice, Evans Clinic at Camp Foster and the Kadena Clinic. The TRICARE Information Center can be reached by calling 315-643-7539.